If your idea of croquet is a game played in the backyard with a $50 croquet set from Wal-Mart, then we would like to introduce you to another side of croquet. Backyard croquet is a fun game for children (and even adults), but the modern sport of croquet combines complex tactics with athletic precision in a game that is fascinating to play and impossible to master. Croquet is fun at any ability level, but there is always something new to learn. A regulation croquet court is flat and fast. This allows for a variety of shots and a level of precision unimaginable in backyard croquet—there is really no comparison. This precision in turn creates scope for subtle tactics. As in chess, you need to think several moves ahead to find the right strategy. Croquet is both a fun social game and a serious tournament sport, and, as an amateur sport, it can even be both things at once. 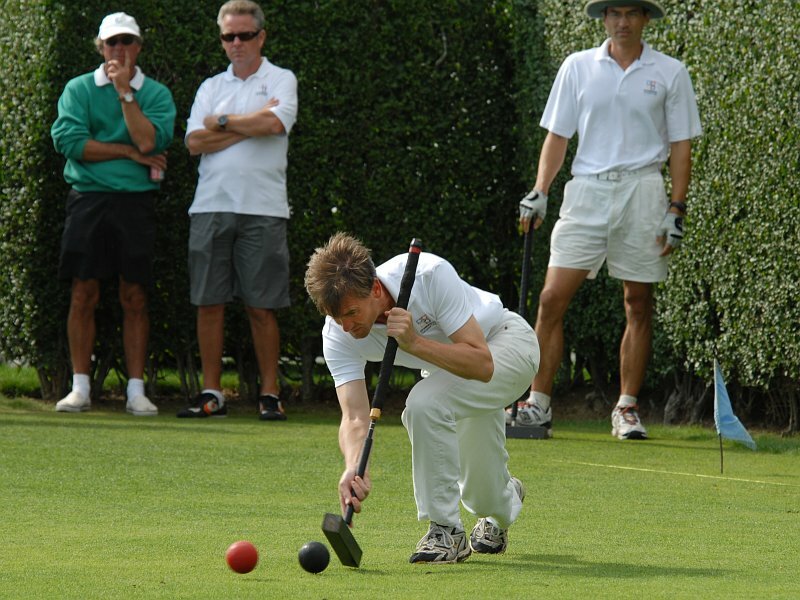 Compared to most other sports, an unusually high percentage of croquet players play in tournaments. Croquet is a great excuse to travel around the country and even around the world, making new friends and meeting up with old ones. If you live near a croquet club, croquet can be a very inexpensive sport to play, because most clubs supply all the necessary equipment. If you take up the game you will want to purchase your own mallet, but a good basic mallet costs less than US$100. Croquet depends more on tactics and precision than on strength, so that it can be played on an equal basis by men and women, young and old. For more information, browse this site’s other reference articles. To ask a question, post a comment to the FAQ list or send us an email.